The series of accidents this year — and specifically the Aug. 20 collision of the destroyer John S. McCain — has shaken the Navy to its core. Pacific Fleet boss Adm. Scott Swift sent an internal message to his commanders saying the accidents occurred while conducting “the most basic of operations,” according to a copy of the message obtained by Navy Times. Chief of Naval Operations John Richardson ordered a worldwide halt to Navy operations, a one-day “pause” that aims to get the fleet back on track. Another factor is the timing of the wars in Iraq and Afghanistan, when the surface warfare community was hit hard by the demand for individual augmentees to support those ground operations, further robbing these officers of shipboard training and experience. “There is a growing suspicion among a small circle of current and former COs that chickens may be coming home to roost,” retired Capt. Kevin Eyer, who commanded three Aegis cruisers, wrote in Proceedings Magazine online after the McCain collision. The growing problem has festered in a SWO culture that many believe is notoriously toxic. Competition and careerism make officers afraid to voice concerns and create an “everyone for themselves” mentality. “Most department heads I had were afraid to go to the captain with anything that might look bad for them — they did everything they did to protect their own reputations and wanted nothing to hamper them from eventually getting in the CO seat themselves,” said former Lt. Jonathan Parin, who served onboard the destroyer James E. Williams. “We’re fostering an environment that is counter to becoming a competent professional mariner and instead it’s about looking out for yourself,” Parin told Navy Times. Hoffman says he and his fellow SWO alumni are speaking out now in an attempt to get the Navy to make a full rudder correction and get back to the basics when it comes to driving ships and training junior surface warfare officers. For nearly 30 years, all new surface warfare officers spent their first six months in uniform at the Surface Warfare Officer’s School in Newport, Rhode Island, learning the theory behind driving ships and leading sailors as division officers. But that changed in 2003. The Navy decided to eliminate the “SWOS Basic” school and simply send surface fleet officers out to sea to learn on the job. The Navy did that mainly to save money, and the fleet has suffered severely for it, said retired Cmdr. Kurt Lippold. “The Navy has cut training as a budgetary device and they have done it at the expense of our ability to operate safely at sea,” said Lippold, who commanded the destroyer Cole in 2000 when it was attacked by terrorists in Yemen. In recent years, there’s been a push to re-energize SWO training. And on paper, they’ve got a course for every level of SWO — all the way up to the commanding officer level. Young SWOs now get about nine weeks in fleet concentration area classrooms. Generally, these new officers report to their ship first and then get a seat in school within the first couple of months on board. Another eight weeks of school comes between an officer’s first and second division officer tours. They are taught more advanced skills, but still, the professional mariner instruction isn’t what it should be, Hoffman said. That’s still just a fraction of the original training. In response to questions from Navy Times, Richardson said the fleet-wide review of Navy operations that he initiated after the McCain collision “will take a hard look at individual training and professional development, to include Surface Warfare Officer School. “It is the Navy’s responsibility to ensure that our SWOs receive the training they need before they go to sea, and we take that responsibility very seriously,” said Richardson. These criticisms began to surface years ago. In 2010, then Lt. Cmdr. Marc A. Drage, then a student at the Marine Corps Command and Staff College, wrote an article titled “Transforming the Surface Warfare Officer Training Curriculum,” hoping at the time to spark some discussion and correction of the issue. Decisions made for saving money have now “posed more leadership, logistical and administrative problems,” Drage wrote. Now for the first time, almost 15 years after that major change in surface warfare training, that first generation of officers who received “SWOS in a Box” are now senior department heads and will soon assume command-level assignments aboard warships. Hoffman says that some officers have been fortunate to serve under good COs who took the time to teach them, but more often, mentoring never occurred. The result is that ships at sea today are skippered by officers who lack of a fundamental understanding of what being a competent mariner truly is. As the search-and-rescue effort to find 10 missing sailors was underway in the South China Sea in late August, the Navy’s top officer said one option for addressing concerns about Navy seamanship and readiness was to look to the defense industry for help. But Hoffman said that’s a symptom of a larger ill: The Navy has grown too dependent on technology. A Navy official told Navy Times that the CNO’s comments were made in the context of a greater partnership in industry, and that the Navy isn’t looking to industry to help them solve basic seamanship issues. Still, too much reliance on technology is an easy crutch, and not a substitute for good-old ship driving skills, he said. “They didn’t run aground, they hit another moving object,” he said, referring to the two major collisions this summer. “If I am staring at my radar, nav chart, phone or other watch standers, then I am not looking out the window,” Hoffman said. There’s no substitute for using your own eyes, he added. The training of today’s SWOs was further eroded by the Pentagon’s focus on the wars in Iraq and Afghanistan. Before 2010, many Navy officers who were expected to learn on the job were not on ships at all. During critical times in their professional development, they were taken away from their ships and sent to serve as individual augmentees with soldiers and Marines fighting in land-based operations. 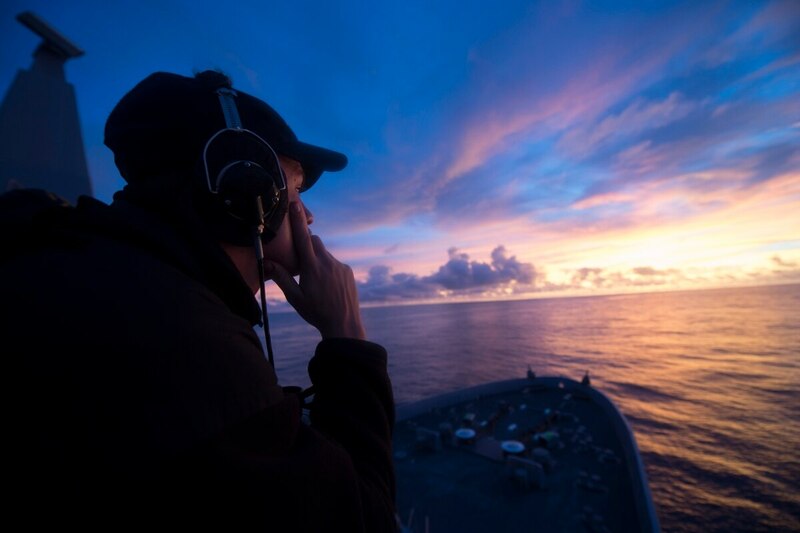 A 2011 study by the Center for Naval Analyses identified SWOs as one of the six hardest hit officer designators by IA requirements. The cost, the study said, was the loss of hundreds of “man-years” in the fleet. “The Navy did nothing to help them make up for that lost time, professionally. They never gave them the chance to get back what they lost,” Lippold said. Parin said today’s Navy culture rewards checking the box on qualifications, passing inspections and stacking resumes with career-minded assignments. Officers spend very little time learning basic navigation skills or other essential seamanship. That results in a feeling, he said, of never really knowing what you are doing. Too much busy work drains the energy of the officers who are responsible for the ship and its safety. Often, those officers are simply exhausted from lack of sleep. It’s probably not a coincidence, Hoffman says, that both of the collisions happened in the wee hours of the morning, when already fatigued sailors and officers are standing watches with little or no sleep under their belts. “When we do go to sea, we have a huge requirement to do engineering drills, combat systems training, etc., which will take precedence over the need for rested and alert watch standers,” Hoffman said.